I grew up in a non-Christian home, and Halloween used to really be no big deal. 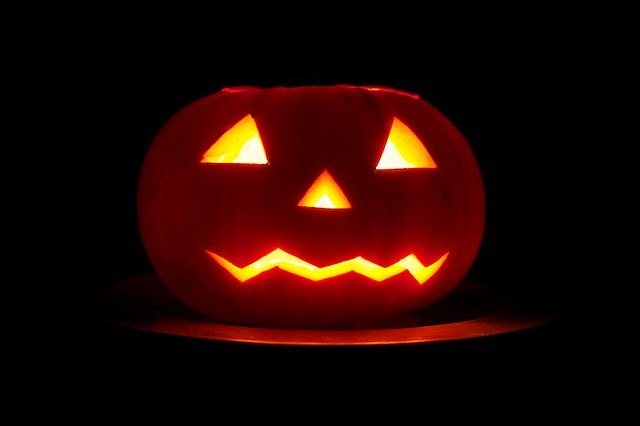 The day or so before Halloween, we would get our pumpkin and carve it into a scary (or silly) face after cleaning out its slimy, stringy innards. On Halloween, we would throw on some homemade costume and stay up late trick-or-treating. It was a one night deal, boom, done and gone. 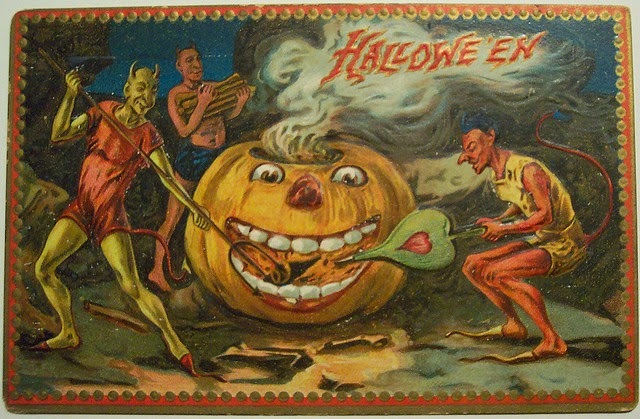 But nowadays, Halloween has become one of the most popular holidays of the year, in some polls surpassing even Christmas, in terms of length of the season (up to two weeks and more for some), money spent on decorating for the event, and parties thrown in its honor. When my children were small (and I was a new Christian), we did participate in Halloween for a brief season, because for my kids, it was just innocent fun: dressing up like a hotdog or a giraffe, getting lots of candy and staying up really late. But at one point, it stopped being innocent fun and became creepy, and thankfully, it was very clear to us when that was, so we stopped. We've done different things since then: we've handed out candy and tracts, we've shut the house down and gone to a movie, we've gone out of town, etc. This year, we've opted to stay home and hand out candy and tracts. While my son and I were recently walking through our neighborhood, we observed that many of our neighbors are celebrating Halloween in macabre, gruesome and over-the-top fashion. We passed yard after yard decorated like haunted houses come to life: cobwebs, spiders, zombies, Frankenstein, vampires, mummies, werewolves, ghosts, goblins, witches, and even makeshift graveyards, complete with corpses and skeletons bursting forth from the ground. My son asked me why it is that people decorate like that, and I told him that it's lost people's way of trying to deal with death. I explained that for the Christian, death has no sting because Christ has conquered death, but that lost people are probably trying to deal with their fear of death by either glorifying it, or pretending it doesn't exist, or making a game out of it, like having Halloween parties with spooky music and eyeball punch and pretzel spiders, or transforming their front lawns into creepy graveyards. We're living in Romans 1 times, a season of spiraling depravity, and what we're seeing in the culture around us is just a reflection of the darkness of the times we're living in. But thankfully, for the Christian, we do know that Christ has conquered death. "With all talking boards you are openly inviting the influence of disembodied entities. Be very careful what you are opening the door to. I wouldn't even consider using it without deep and sincere prayers for protection." "To get answers from your board it is important that you relax and concentrate only on your question. Try to clear your mind of everything else. The Ouija Board is my favorite game and I thank my aunt for introducing it to me." "When I was about to use it I got the creeps and I thought about how this could change my life so I put it away in my garage and left it there for about 8 months without actually using it but playing around with it. I told my neighbor that I had one but I didn't use it at all. She told me if she could use it. I told her just to be careful with it. Since her cousin was there, they both used it. The next morning I called her and I could hear them laughing and saying, "Oh My Gosh. "They were playing it and I asked them if it really did work. She said it's so cool. I went over her house in excitement and I sat there, watching them play and just seeing how quickly the message indicator would move across the board. I couldn't believe how accurate it spelled out everything. So we played all day long and time went by fast because we were so into it. The board told us it was a good spirit so we were okay. The next day it said strange things and creepy things so we decided to put it away and not use it for a while. It's really fun though but you just have to be careful with it. It's a must have. " "Brought back childhood memories! got it for my teenage daughters sleepover and the girls had a blast." "We tried it once at my house at about 8 pm, but there was no activity on the board. This didn't surprise me because I didn't find my house to be haunted. However, since we used the Ouija board at my house, I have been hearing footsteps in the hallway outside my bedroom and in my bedroom, as well as on the main level of the house. I hear activity in the kitchen and my parents' voices when I'm home alone. Nothing bad has happened, it's just a little freaky........Now, I'm not going to say the Ouija board doesn't work because there are entities at my house now." "It didn't seem to work very good. I don't think they are made as good as the older one's. My granddaughter was pretty disappointed, plus it didn't glo at nite." "Bought this for my 11 year old daughter at Christmas. We have fun asking dumb questions and understand that it has nothing to do with god or spirits... it's a BOARD GAME! If you're NOT ok with it, DON'T purchase the product. If you're open minded and can have fun with it, then this might be for you.....My son's girlfriend gets really freaked out, and we like exacerbating her fears, but she's a good sport. Good times!" "I had a Ouija Board when I was 12, so I ordered this one for my son for Christmas. He and his friends have had tons of fun 'communicating with spirits'!" "i bought this cause both my inlaws past away and my husband wanted to talk to them well it worked. my husband got his answer to bad it only worked the one time now we are not getting anything"
"We didn't meet any insane, crazy, or emotional people either time it worked. Just spirits that were informative and told us the basic details of their names, age, location, & death when we asked. I guess they weren't harmful spirits. I have met a few people who have met suspicious or emotional characters, so definitely be careful when messing with these. Just because my experiences were fine doesn't mean it will be the same for you." "I bought this Quija board for my daughers birthday party, the girls had a blast scaring the heck out of themselves with this board. To funny, plus it glows in the dark! what more could you ask for?" "I got this for my 13-year-old daughter. The product itself is fine, she likes it and uses it with most of her female friends. The problem is, some of the girls are adversely affected by it. I noticed one of them was crying and several of them were attracted to the darker aspects of the "spirit world." It seems like every other 'spirit' with whom they 'communicate" committed suicide or was murdered'." "My sister passed away two years ago and many times we had this boad predict our futures, future surgerys, health problems, boyfriends, good things and bad things have happened, we always said a prayer and protected ourselves with crosses,if you belive its a respectful item I dont consider a toy, if you belive its a toy maybe your only asking for trouble...or fun, just have respect for something that may be made by Hasbro now but was once a respected tool for talking with those who had passed, and getting answers!" "Fun birthday present for my 14 year old daughter, she loved it. Cute & Fun. Glow in the dark is a great added feature." "It's a fairly harmless game if it is respected and not overused. I recommend not asking it the same questions over and over again because the unseen force may not like that. I also recommend praying a prayer of protection before and after using the board as a safety concern for the super religious fanatics; however I doubt that it will possess anyone as I've used it many times and I've never been possessed." "I have played this game before and I don't know why everyone is ranting about it being " demonic". It is a toy. It is not inhabitated by evil spirits or bewitched by Satan. It is a toy. I am 10 years old and am never frightend by it. I will admit that creepy things do happen, and that there are spirits, but they are not evil. They can not hurt you. They will not kill you. They can be nice, clever, and friendly. If you are ever bothered by anything the spirit says, tell the spirit to stop. They will listen. Buy this and you will not regret it! Great for sleepovers." "i was with my friend kylie and my other friend will. when we asked who the spirit who it was it said the gradmother of william so we made william get off the board, then we asked her questions that only he would know such as what he called her when he was little [nini] and what he called his grandfather [susu] when she died  and other such questions. he was so astonished he's bought one and uses it all the time and has gotten to the point where he can ask questions in his head and do it by himself. it's not fake, i did it this weekend and you can definitely feel the energy pulling it." "At first i wasnt really into "spirits" or bringing back the dead, but after using an ouiji board, it changed my mind. When me and my 2 friends used it, we didnt do it correctly and i could tell that one of the friends kept on moving the piece. So while she was away, me and my other friend did the ouiji board correctly by sitting "indian style" with our knees touching and we balanced the board on our laps. We placed our fingers on the piece slighty and asked questions waiting for the piece to move. After about 10 minutes, it didnt move, so me and my friend were ready to just give it up. Then I could feel the piece moving on its own, and me and my friends fingers were barely touching it. We continued to have a conversion with a spirit by the nickname of "fuz" and he answered questions that i never dared to tell my friends. I was certain she wasnt moving the piece because she didnt know the answers and i didnt want to move it because i wanted to believe it was real, and it was. We talked with this spirit for a while, and he told us he was right beside us. After we were done, i felt very cold and chills going up and down my arms. I felt like i was going to pass out and i almost felt like crying, so i went to bed. 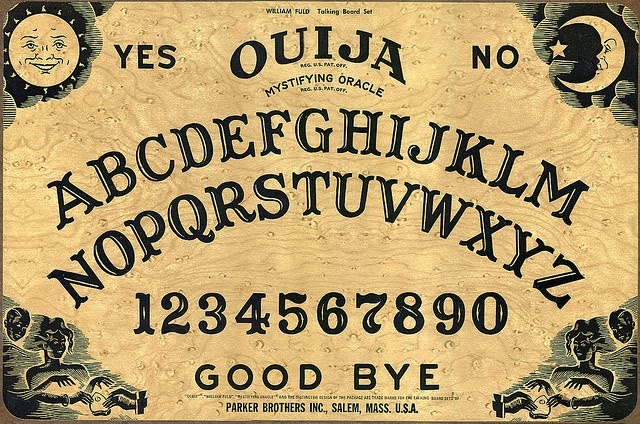 The ouiji board is very real, and if your not afraid of contacting the dead, i suggest buying this because it is a........lot of fun." The Ouija Board - Just A Game? Spirit Contact: Who Is On The Other Side? You can also listen to some of Marcia's radio interviews dealing with the occult and Halloween here (scroll down to "Marcia Montenegro Interviews"). Have you ever wondered why the dark is so scary? Well, have you ever been in total pitch black darkness, the kind where you can't even see your own hand in front of your face? What do you think you would do in that kind of darkness? You would probably stick your arms straight out in front of you and try to feel your way around, so that you won't trip over something or walk into a wall. And you would probably take little baby steps for the same reason. It's kind of disorienting and hard to do anything in that kind of darkness, isn't it? Even if you're just in bed sometimes, if it's that dark, that kind of total darkness we’re talking about, your mind can start imagining all kinds of things. Maybe you put the covers up over your head. But even that can be scary. But why? It's scary because you can't see. You can't see what is really around you, what's really there. You can't tell if you're about to walk into a wall, fall down a flight of stairs, or trip over something. You can't see if you are by yourself or if someone is with you. What's the only thing that can help in this situation? Light. Any kind of light. Once you have a light- everything changes, you relax because you can see. Did you know that the Bible talks a lot about light? As a matter of fact, the very first words the Bible records God saying are "Let there be light." God spoke this at creation. And did you also know that two thousand years ago, God sent Light into the world a second time. Why would God need to give us light again? Well, the first time God sent light, it was physical light, because the world was dark. It was the kind of light that our eyes need so that we can see. But the second time God sent light, it was for a different kind of darkness. A kind of darkness that is not about our eyes…but about our hearts. Just like the "eye" kind of darkness keeps you from seeing things around you as they really are, the "heart" kind of darkness keeps you from seeing the truth about God. What is it, then, that makes our hearts dark? All of our hearts are dark because of sin. Sin is disobeying God. God is the One who created you, and the world, and the light, and all things. We sin when we disobey God by our thoughts, our words, and our actions. So how do you know if you’ve ever sinned? Well, you can ask yourself some questions: Have you ever told a lie? Have you ever taken something that didn't belong to you? Have you ever disobeyed or dishonored your parents? If you’ve answered yes to any of these questions, then you have sinned, because those are some of God's laws. And God is so holy and so perfect, that if we commit just one of these sins, we stand condemned before this holy and perfect God. Sin is bad because it offends God, who is good and perfect and holy in every way. Think of our sinfulness and God's holiness in the way you might think about oil and water: they just don't mix, do they? Sin breaks the relationship between you and God. Sin keeps you from seeing how good God is. This is a terrible reality. Think of it this way: as scary as it is to not be able to see with your eyes what is around you, like when you're in pitch black darkness, it is even scarier to not see God for who He really is. But, like I said earlier, God sent Light again. Only this time, it was the kind of Light that our dark hearts need. This Light has a name…and the name of the Light is Jesus. Jesus was not just a good man, as some believe; He was fully man and fully God at the same time. He was born into the world in the same way that you were, as a baby. He was a toddler, a child, a young man, and finally an adult, and in all the years that He lived, Jesus never sinned in thought, word or deed. Jesus lived a life of perfect, holy righteousness. Instead of breaking God’s moral laws, like we have, Jesus kept them all, every single one of them. He did this so that He could then give His own life for ours, and He did this by allowing himself to be tortured and then hung on a cross to die as a payment for our sins. We stood guilty and condemned before God, who is the holy and just Judge of all the universe, and yet Jesus paid our fine so that we could be set free. When we examine ourselves in light of God’s moral law, we should recognize our need for a Savior, and understand how amazing this gift from God is. Do you know what happened to Jesus? The last you heard about him, he had been killed by being hung on a cross. But guess what? Because Jesus had never once sinned in his life, He did not stay in the grave. The Bible tells us that the wages of sin are death, and since Jesus had never sinned, death could not hold him. On the third day after his burial, Jesus was raised from the dead, and many people in the town where He lived witnessed that Jesus, whom they had seen killed, was indeed alive again! They saw him, they heard him teach, they talked to him, walked with him and even ate with him. You see, God had raised Jesus from the dead, a fact recorded by many historians, as proof that Jesus’s payment for sins was acceptable in God’s eyes. So what does this mean for you? Well, if you have broken God’s moral laws, you need a Savior. But thankfully, God provided that Savior in Jesus, who kept all the moral laws, and then gave his own perfect life as a ransom payment for those who place their faith in him. This is called repentance. If we repent, that is, if we turn away from our sins, and turn toward God by trusting that Jesus’s payment on the Cross has the power to cleanse us from our sins, then God forgives us. Our hearts will have light and with this light, which is spiritual light, and not just a physical light like a lamp or a candle, we will see God as He really is, and we will love Him, and worship Him, and serve Him. God will also cleanse us on the inside, and will give us new hearts and new desires, desires that are pure and holy. The Bible calls this being born again, when we have moved from being a prisoner in the kingdom of darkness into the kingdom of Light. So when you're scared of the dark, it's only to show you that you need light. And when you have a dark heart, it's only to point you to the fact that you need a Savior. This is why the Bible calls Jesus "the Light of the world." What Do We Do With Halloween? What Do You Mean By The Occult? The Occult and Paranormal: What Does God Say?